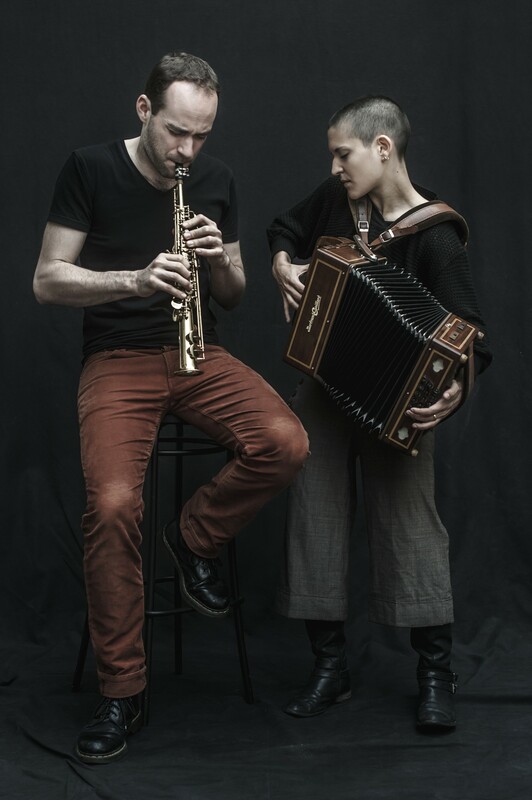 Rhizottome* brings together Armelle Dousset on accordion and Matthieu Metzger on sopranino saxophone, with the goal to get back to their roots and so improve innovation. The French duo offers an exhilarating and challenging live experience, generous concerts which may even turn into a dance party. Their rare extensive tour in the Baltics celebrates the Francophonie during three weeks. Starting on February 28th in Finland, it takes them to Estonia and Latvia from March 3rd to 11th, and back to Finland till March 20th. Armelle and Matthieu started their duo in 2008. At first, they played in the streets, at dancing parties with a repertoire based on neo-traditional tunes and also some classical melodies (Rameau, Telemann, Schubert…). Through the years they have composed their own music, which they mostly perform nowadays, in concert halls, theatres, festivals… They have recorded two albums released by NoMadMusic. Rhizottome has performed in France, Italy, Portugal, Belgium, Japan and Korea.